I made these for Thanksgiving...yes Thanksgiving. I told you that I did not stop baking when I took a break from blogging. You probably saw these floating around the internet, like I did. They look so beautiful that I had to make them and they are incredibly easy! I served them on my dessert table, but I think they would be a really nice addition for a brunch. If you don't eat them all right away, they re-heat well and are definitely best warmed. Preheat oven to 375 degrees Fahrenheit. Grease a 12 cup muffin tin. Remove puffed pastries from freezer and thaw according to package instructions. Slice the apples in half from top to bottom. Remove the core ends and then scoop out the core in the center. Slice the apples into very thin slices. Fill a medium sized bowl half full of water. Squeeze the lemon juice into the water. Place the sliced apples in the water and microwave for 5 minutes until slightly tender. Drain the apples into a colander. Mix the apricot preserves and water together in a bowl. When pastries are thawed, place them flat on a floured surface. Roll the pastries out with a rolling pin to flatten slightly. Cut each pastry into 6 equal slices. One at a time, spoon apricot preserve mixture onto a slice of pastry. Place 7-9 apple slices along one half of the pastry slice with the peel side facing out. Fold the pastry in half to cover the apples. Starting on one end, roll the pastry and apples to the other end of the pastry. Place in a greased muffin tin. 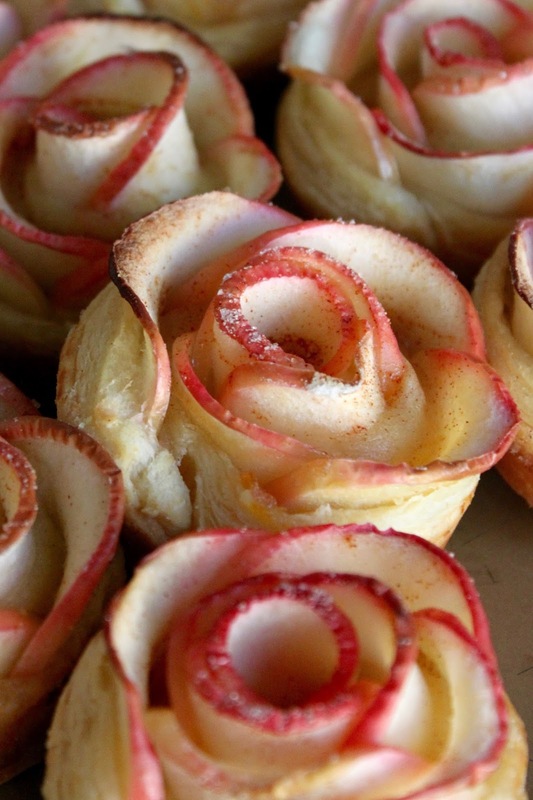 Continue with the other pieces of pastries until you have 12 apple roses.